The only thing better than eating and drinking on an outdoor patio during Chicago summer? Eating and drinking on an outdoor patio on a Chicago beach. After a frazzled day of dealing with gridlocked traffic and manic coworkers, it’s time to sit back, feel the cool breeze off the lake, and start to appreciate life again. These beachside spots are just the places to do so. 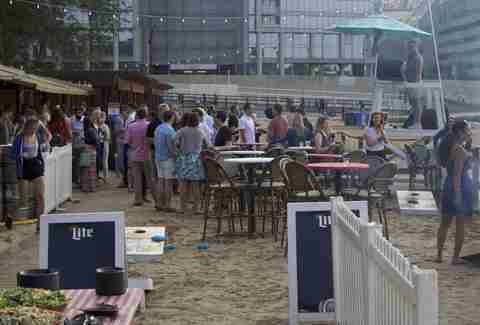 Soon, Castaways won’t be the only game in town when it comes to North Avenue Beach boozing. 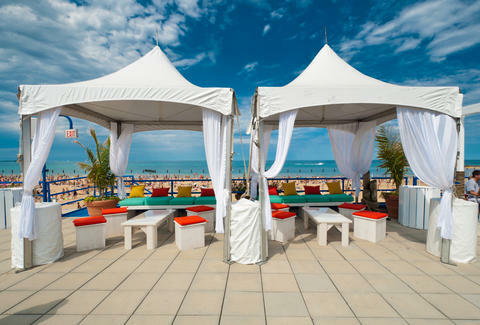 With an opening planned for August 1, the upscale Shore Club will be serving Mediterranean-inspired cuisine and beach-themed drinks in three distinct spaces near the lakefront path. The most accessible and traditional “beach bar” will be Patio at Shore Club, a laid-back open-air space featuring artist demos, cooking classes and workshops, in addition to food and drink. The Restaurant at Shore Club will offer floor-to-ceiling windows and massive views of the lake as it serves dishes like lobster taquitos, BBQ jackfruit, grilled baby octopus, and a Sunday brunch. 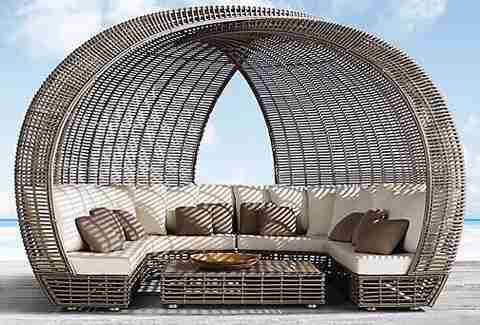 The most exclusive of the three venues will be the reservations-only Oasis at Shore Club, where you can book cabanas and daybeds before kicking back like a baller over shared plates and top-shelf champagne. With a planned opening for late summer/early fall, The Lakefront Restaurant will open at Fullerton and Lake Shore Drive as part of a series of major renovations surrounding the new 300-seat Theater on the Lake. Leading the restaurant will be former Fountainhead chef Cleetus Friedman, who is planning “Midwestern seasonal fare with a French influence” like whiskey bacon deviled eggs and buffalo falafel to be served in the 125-seat restaurant, as well as its 100-seat outdoor patio, with an additional 40-seat outdoor lounge area serving burgers, dogs, and chicken. Friedman and company have big goals for the sprawling campus, with food and drink festivals and “farmers market meets carnival” events planned in the green spaces surrounding the restaurant next year, plus an Air and Water Show event planned for this summer. DJs and live bands on the weekends, frat bros chugging beer buckets, girls frusta-crying into their phones. Ah, Castaways -- don’t ever go changing. 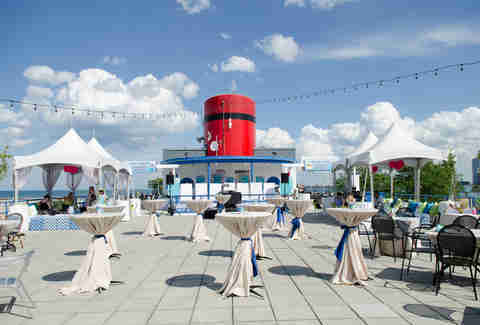 Despite an attempt to go more upscale with upper-deck cabanas, the massive ship docked on North Avenue Beach is instantly recognizable to anyone with even a passing familiarity with hopping summer nights in Chicago. You might not remember much, but you remember you had a good time, which is all that really matters when it comes to beach bars. 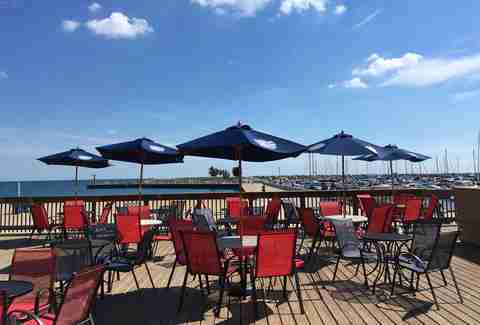 There may not be live music at this locals-friendly spot due to close proximity to neighbors, but the lack of untz-untz helps foster a friendly vibe at this beachside oasis famous for stiff frozen margaritas and house-made nachos. If you’re looking for something spicier, opt for some sweet chili shrimp or a hot dog topped with jalapeños and adobo seasoning. It’s a small space run out of a concession window, and sometimes not all menu items are available, so just focus on sipping your sangria or Revolution Anti-Hero as you watch the sunset, and everything will be just fine. 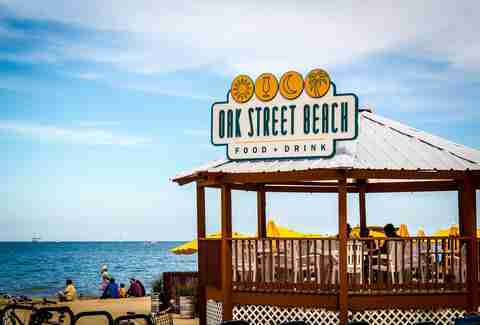 For a more chill waterfront bar experience, head to the criminally underrated Ohio Street Beach for one of the best views in the city, where the buildings along Lake Shore Drive nearly touch the sand. Check out boats partying in the Playpen or grab a bite to eat at the relaxed but lively Caffè Oliva, where occasional events like Air and Water Show parties and Sunday night lobster dinners pair with a standard bar menu and a few left-field offerings like grilled souvlaki and lamb burgers. But, really, the view is what you’re here for. This little, hidden gem is a concession stand wrapped inside another hidden gem known as 12th Street Beach, located on the eastern edge of Northerly Island within spitting distance of the Adler Planetarium and Huntington Bank Pavilion. It serves Polish sausage and burgers, but the authentic Mexican carne asada and al pastor tacos are what this place is all about (in addition to burritos and house-made gorditas.) You can either eat your tacos on the patio or take them for a stroll on the beach. Just thinking about this place is enough to put pretty much any Chicagoan who’s been here in a pretty damn good mood. Live bands play almost every night around sunset on one of the best outdoor stages in the city, where you’ll kick back on the patio with vodka lemonade, margaritas, lobster rolls, and pork-steak po' boys. Stare at the stage, stare at the people, stare at the water. There’s not a bad place to look. While it may not technically qualify as a “beach bar,” this lakeside hangout in grassy Berger Park is easily one of the cutest spots in all of Chicago. Take a date (or your dog, or both) to this lesser-known, off-the-beaten path spot for a quiet evening of summer romance soundtracked by live bands nightly, Wednesday-Sunday. In addition to the usual beach fare of fish and chips and coconut crab cakes, The Waterfront Café gives a nod to the surrounding hood with Middle Eastern delights like falafel and lamb shawarma. 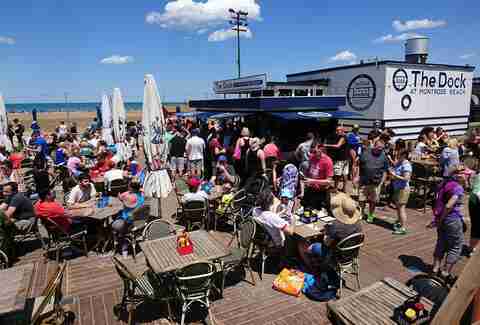 This happening spot -- formerly known as 31st Street Beach -- often gets overlooked by the crowds of revelers making their way to North Avenue or Oak Street. Serving a basic menu of burgers and dogs while curating a fun and lively scene, which includes a wide array of events from salsa lessons to house DJ parties to workout classes taking place on an intimate wooded beachside deck, they’ll even deliver food to your yacht (if you have one). With another primo location just off Lake Shore Drive, this centrally located spot falls somewhere between Castaways and Caffè Oliva on the party meter. It’s loud without being annoying, and popular without being overcrowded. It’s got rum punch and Chicago dogs, and barbacoa tacos and sweet tea vodka. Offering pretty much everything you need in a beach bar, you may not love it, but it’s a pretty hard place to hate. This charming little turquoise shack is a beloved destination for a crazy array of crepes from chicken fajita to spinach and ricotta with pesto, or the sweeter variety stuffed with everything from fruit to Nutella to M&M's. Chicago dogs, tuna melt paninis, and black-bean burgers help round out a surprisingly diverse menu to explore on a small outdoor patio with a few tables and umbrellas. If you feel like you’ve just discovered your favorite new secret spot, that’s because you just did.